A perfect end to any meal. Do you ever start making a recipe before you read the whole thing, just to find out that you don’t quite have the correct dish to bake it in? I am always in a hurry with working a full time job, working on my blog and the list goes on… and sometimes I have a tendency to not look recipes over as closely as I should. I found this recipe and thought that it would be great for our weekly Friday pizza night with our daughter and granddaughter. I had read that you could use custard cups for the recipe, which I have, but I didn’t look at the size of custard cups that were listed in the recipe. Oh well, the recipe turned out to be amazing, sometimes you just have to go with what you have. This was a nice ending to our pizza night. 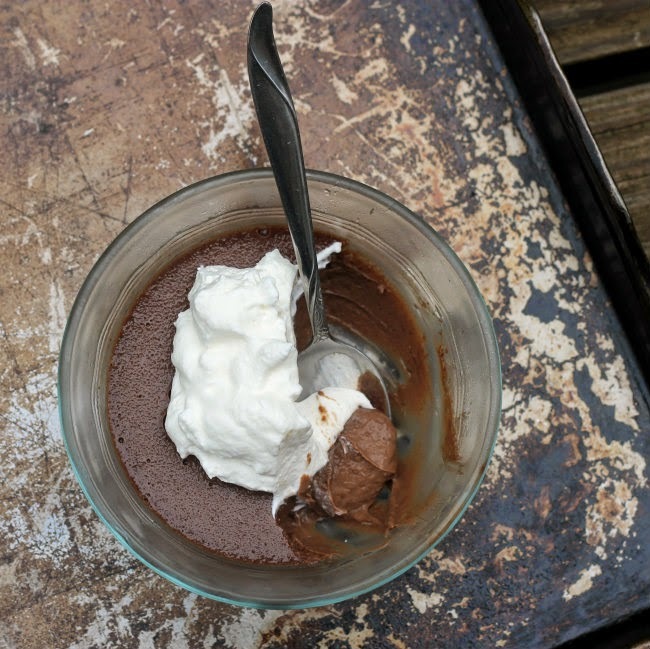 The chocolate is so creamy and just the right amount of chocolate. Even Mike, my guy who is not a big chocolate lover had to admit that he enjoyed it. I served it with a bit of sweet whipped cream… for a totally amazing dessert. I forgot to mention there really isn’t a lot of work that goes into making this dessert and I also forgot to mention that I was able to make these the night before, so we didn’t have to wait for them to bake. I was able to take them out of the refrigerator and they were ready to go. Well I think I have babbled enough tonight, it is getting hard to keep my eyes open, so I will finish with this… if you like chocolate you have to try this dessert, it is totally yummy. 2. Place the chocolate chips, cream, and milk in a small to medium sauce pan. Heat over medium heat stirring frequently until the chocolate chips are completely melted and the mixture is smooth. Remove from heat. 3. In a small bowl whisk the egg yolks and sugar until well blended. Whisk in a tablespoon of the chocolate mixture, continue adding chocolate to the egg mixture until you have about 1/4 cup of the chocolate mixed into the egg mixture (this is to warm up the egg slowly, so they are not cooked by the hot chocolate). Once the small amount of chocolate is add to the eggs, return this mixture to the sauce pan with the rest of the chocolate and mix until well blended. 4. 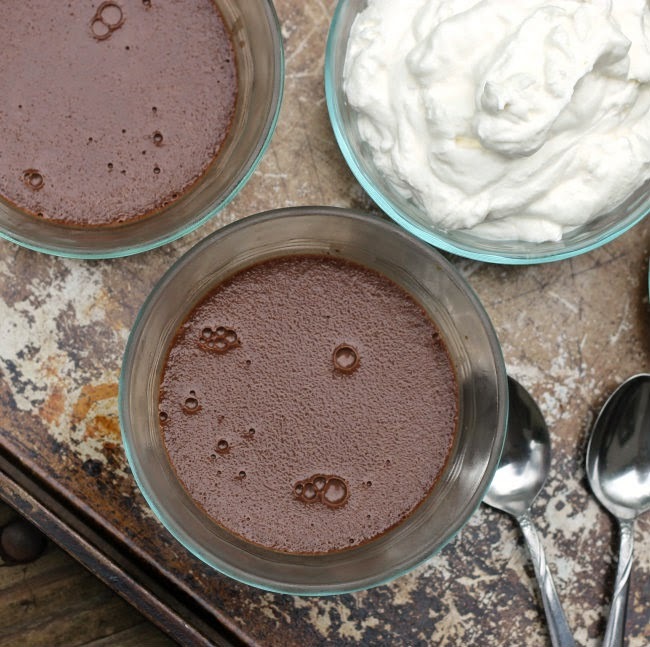 Pour evenly into four 8-ounce custard cups or ramekins or six 4-ounce custard cups or ramekins. Place in a large baking pan Pour water into the baking dish to about 1/2-inch depth. 5. Bake for 30 minutes or until custards are set around the edges and centers still move. Cool custard cups in dish until cool enough to hand. Remove custard cups from water and place in refrigerator to cool completely. Once cooled cover with plastic wrap. Custards can be made up to 2 days in advance. When entertaining I often look for desserts I can make the night before. Makes the day of the party go so much smoother. 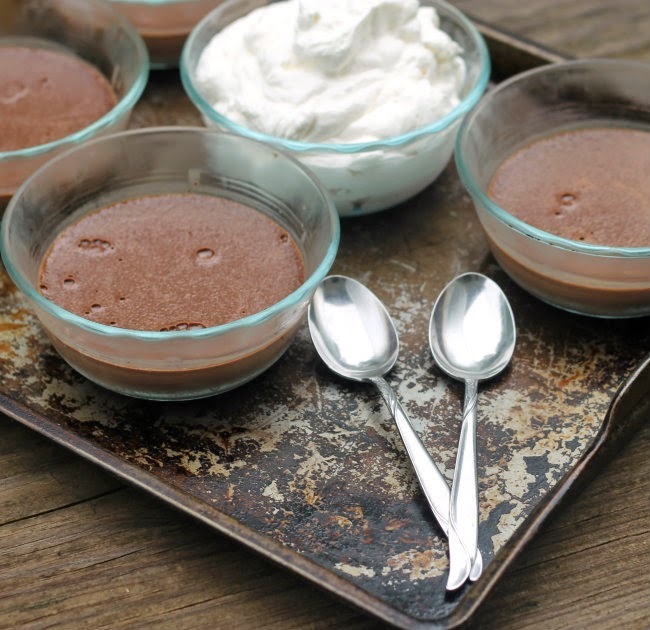 We love pots de creme and yours look divine! I need to put these on our menu…it’s been way too long since I’ve made any. Haha ummm yes. Constantly. Looks like these still turned out though, so win win win!! What a luscious treat!